Forget the Iowa caucuses or the New Hampshire primary. 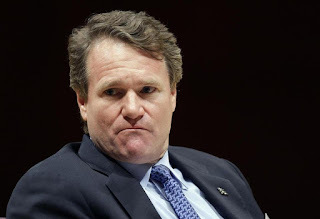 One of the more intense and dogged campaigns is currently being waged by Bank of America to convince shareholders that Brian T. Moynihan should keep his job as both chairman and chief executive. Top bank executives and one of its board members have pounded the pavement from London to Houston, lobbying dozens of investors. They cut a deal to mollify one outspoken critic, and they enlisted the help of the former Massachusetts congressman Barney Frank, an architect of Wall Street’s regulatory overhaul. Mr. Frank said he agreed to make the case for Mr. Moynihan after discussing the issue with his neighbor, an executive at Bank of America, the nation’s second-largest bank. The battle engulfing the bank has had, at times, the feel of a local City Council race. It has featured a cast of characters including a Roman Catholic priest, Warren E. Buffett and two giant California pension funds that have mounted an aggressive countercampaign to strip Mr. Moynihan of his chairmanship. As many as 40 percent of shareholders were expected to vote against Mr. Moynihan from the outset, leaving about 60 percent up for grabs — a huge group that includes major money management firms like T. Rowe Price and BlackRock. That the vote, scheduled for Tuesday in Charlotte, N.C., has proved so contentious shows the depths of discontent with Bank of America, mostly over how the bank’s board decided to give Mr. Moynihan both titles in the first place. It did so unilaterally last year, overturning a previous shareholder vote in 2009 that required the bank to have a separate chairman and chief executive. But the battle also illustrates how the byzantine world of corporate governance can consume the time and attention of a company’s leadership. Bank officials say Mr. Moynihan, chief executive since 2010, earned the right to also become chairman last year, having steered the company through a near-death experience after its costly acquisition of Countrywide Financial in 2008 and Merrill Lynch in 2009. They say there is no conclusive evidence that companies with separate chief executives and chairmen perform better than those that don’t divide the roles. The two pension funds leading the charge against the bank — the California Public Employees’ Retirement System and the California State Teachers’ Retirement System — argue that an independent chairman would provide better oversight of a bank with a troubled history. The pension funds’ sway goes beyond their less than 1 percent ownership of the bank’s shares. They have been calling and writing to the largest shareholders — including some firms they may pay to manage money on behalf of the California pensioners — urging them to vote against the combined role. For some shareholders, the C.E.O.-chairman vote is more of an incidental bargaining chip. When the issue came up in 2009, for example, union groups that supported separating the roles were also pushing behind the scenes for the right to organize Bank of America employees, according to people briefed on the matter. If anything, the current contest — which has reached a fever pitch this week — has been an unwelcome distraction for Bank of America just as it had put most of its legal and regulatory troubles behind it. In 2013, JPMorgan Chase’s chief executive and chairman, Jamie Dimon, faced a similar vote, which had been stoked by the bank’s embarrassing trading loss, known as the London whale. Mr. Dimon prevailed. Bank of America’s campaign is being run by its general counsel, Gary G. Lynch, and its head of global marketing, Anne M. Finucane, who has labored for years to burnish Mr. Moynihan’s image as a banker willing to work with regulators and community groups to right the wrongs of the financial crisis. That image was dimmed by the board’s decision last October to overturn a bylaw that required the bank to keep its chairman and chief executive roles separate. The board argued that like most big American companies, Bank of America should have the ability to decide whether to grant its top executive one or both titles. Still, some shareholders and others were outraged. Sensing his moment, the Rev. Seamus Finn proposed putting the issue to a vote at the bank’s annual meeting in May. Father Finn, a Catholic priest who advises church groups on investment issues and is chairman of the Interfaith Center on Corporate Responsibility, said the leadership question was not his primary concern, but he figured that a proposal to split the role would probably get him a meeting with the bank’s top leadership. It worked. Bank of America agreed to give Father Finn what he really wanted — a report detailing what went wrong at Bank of America during the mortgage crisis. And in return, Father Finn said he agreed to dropped his proposal to divide the top positions. Even though the issue did not make it on the ballot at the annual meeting, the proxy advisory firms Institutional Shareholder Services and Glass Lewis urged the bank’s shareholders to vote against members of the board’s corporate governance committee because of the unilateral decision to combine the titles. Acknowledging the extent of the shareholders’ displeasure, the bank decided to put the issue to a special vote and started campaigning. A major player in the effort is the bank’s lead independent director, Jack O. Bovender Jr., a former health care executive and Duke University trustee. Described by a bank colleague as the consummate Southern gentleman, Mr. Bovender has been making the rounds of investors, explaining why the board moved to make Mr. Moynihan both chairman and chief executive. Mr. Bovender has not been able to win over everyone, though. In a conversation last month, he told Institutional Shareholder Services how he agreed to take a leadership role at the bank only if no other board member wanted to step in. With I.S.S. and Glass Lewis recommending that the jobs of chief executive and chairman be separated, the bank most likely lost as much as 30 percent of the vote because certain shareholders vote automatically with the proxy firms, people briefed on the matter said. In trying to win over other investors, the bank has had to navigate somewhat unfamiliar territory. Each large investor approaches these votes differently. Some firms consider the opinions of their portfolio managers and analysts, who recommend whether to buy the bank’s shares. Others allow only their corporate governance committees to weigh in. Bank of America cannot even lobby its largest shareholder, BlackRock, directly. Because BlackRock is partly owned by another bank, PNC Financial Services, the giant asset manager has to outsource its vote to an independent fiduciary so as not to run afoul of the Bank Holding Company Act. Last week, Bank of America got help from Mr. Buffett, who said in a television interview that Mr. Moynihan deserved both titles. Then, Mr. Frank voiced support for the combined roles, calling Mr. Moynihan “one of the more constructive” bank leaders in helping shape recent financial regulation. Mr. Frank is not a Bank of America shareholder. But his endorsement could persuade some unions or progressive-minded investors to break from the California funds and back the bank’s position. Mr. Frank said he volunteered to speak publicly after discussing it with his neighbor in Newton, a Boston suburb, who works for the bank in communications and public policy. Mr. Frank, who recently joined the board of Signature Bank, a small commercial bank in New York, said the most important oversight of financial companies comes not from its directors but from regulators. “People expect too much of boards,” he said. I would have to disagree with Mr. Frank, people should expect a lot more from boards, many of which are filled by incompetent people who are not asking enough questions but are there to collect a cheque. So, 97 percent of S&P 500 companies don't split the role of chairman and CEO or have flexibility to decide who occupies such a role? If that's the case, Congress should pass corporate governance laws making it illegal to occupy a dual role under any circumstance. For me, it's pure logic. Why would you want to give the CEO of a major bank, especially one that was embroiled in the mortgage crisis that led to the 2008 crisis, a lot more power? Big U.S. banks aren't just any old S&P 500 company, they're systemically important financial institutions and need a lot more scrutiny from regulators, board members and investors. The bad news for Moynihan is that neither Berkshire’s preferred shares or warrants hold a vote, meaning Buffett has no recourse to participate in the shareholder vote. Sure, having Warren Buffett on your side always helps, but I have to wonder why the Oracle of Omaha is praising Moynihan's performance. The bank has turned around since the crisis and Moynihan has cleaned up a huge mess but when I look at the performance of Bank of America (BAC) relative to other big U.S. banks, I'm hardly enthralled and neither are many shareholders. Brian T. Moynihan, the Boston banker and lawyer who became chief executive of Bank of America, is facing the first shareholder challenge of his five-year tenure as concerns mount over his leadership and the bank’s performance. Moynihan, a Wellesley resident, has shepherded the nation’s second-largest consumer bank through the financial crisis and its aftermath, settling billions of dollars in federal lawsuits over bad mortgages and faulty foreign-exchange practices, shedding unprofitable units, closing hundreds of branches, and shoring up capital to withstand another economic shock. But shareholders are wondering whether the 55-year-old executive, known for hard work and sharp thinking rather than salesmanship, is best able to lead the bank into a new era of growth. On Tuesday, they’ll vote during a special meeting on whether to bless a decision made last year — without consulting shareholders — to expand Moynihan’s authority by making him chairman of the board of directors as well as CEO. On paper, it may be a vote about corporate governance, but analysts and bank observers say that it has become much more, a test of the confidence shareholders have in Moynihan, the board, and the bank’s direction. Moynihan is expected to win the vote, and even if he doesn’t, he would still run the bank’s operations, fetching a $13 million salary. But a smaller margin of victory — less than 60 percent of the vote — could weaken Moynihan, analysts said. Bank of America officials seem well aware of stakes. Anne Finucane, a Lincoln resident who is global chief of strategy and a vice chairwoman of Bank of America, has been rallying support among the bank’s largest shareholders. One very prominent Bank of America investor, Warren Buffett, has spoken out in favor of Moynihan, crediting him last week with resuscitating the bank. Former US representative Barney Frank, the Newton Democrat who crafted the post-financial crisis banking law that bears his name, has also backed Moynihan, doing a round of interviews during the past few days. Frank noted that the bank has settled federal charges over its mortgages and that Moynihan was one of the few top banking officials to publicly support the formation of a federal financial watchdog agency, the Consumer Financial Protection Bureau. Other banks, including JP Morgan Chase & Co. of New York and Wells Fargo & Co. of San Francisco, have dual CEOs and chairmen, and no research suggests that splitting the roles improves performance, Moynihan supporters add. But several institutional investors, including the Massachusetts pension fund, plan to vote against combining the chairman and CEO roles. The California public pension funds, the largest in the country, are telling shareholders that management needs stronger oversight from an independent chairman. 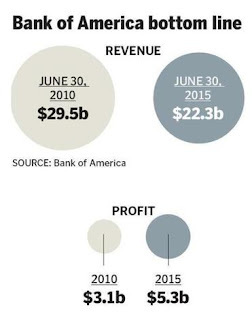 The pension funds point to the bank’s poor financial performance and a $4 billion accounting error made last year. The bank has also struggled with its Federal Reserve stress tests, earlier this year earning a warning from regulators about deficiencies in its ability to predict how it would perform in a severe downturn. Bank of America’s share price closed at $16.33 Wednesday, a 4 percent increase from January 2010, when Moynihan took over. The stock fell 2.9 percent Thursday, to $15.86. Meanwhile, the stock of its competitors has soared. Shares of Wells Fargo, the nation’s third-largest bank by assets, have nearly doubled in price during that period. The share price of JP Morgan Chase, the nation’s largest bank, has climbed almost 50 percent. Aeisha Mastagni, portfolio manager for the California State Teachers’ Retirement System, said directors should hold Moynihan accountable for this performance. Moynihan’s rise was somewhat circuitous. As a lawyer, one of his primary clients was Fleet Financial Group, which he advised on acquisitions that helped make Fleet the largest financial institution in New England. Fleet eventually hired Moynihan as deputy counsel and later put him in charge of the bank’s investment and wealth-management unit. Bank of America bought Fleet in 2004; Moynihan continued to lead the combined company’s wealth management operations and then consumer banking. When former chief executive Ken Lewis abruptly retired following the disastrous acquisition of the mortgage lender Countrywide Financial Corp., the purchase of the investment company Merrill Lynch, and multiple investigations by state and federal authorities, the board turned to Moynihan. He took over as CEO of the sprawling bank in 2010, but by that time shareholders angry with Lewis had already separated the roles of chairman and CEO. While managing the company — with headquarters in Charlotte, N.C. and a significant presence in New York — Moynihan has remained rooted in Wellesley. He still goes to the dump on the weekends, attends Mass, and on Thursday chaired a Boston gala to raise money for priests’ retirement and health care costs. Under him, the bank has spent about $70 billion on fines, settlements, and legal costs and cut 15 percent of its employees and 20 percent of its branches and offices. His supporters say Moynihan spent the first two years of his tenure cleaning up past problems and putting the bank on firmer footing. Deposits have grown by nearly 25 percent to $1.2 billion, and profits are up nearly 70 percent to $5.3 billion in the second quarter, from $3.1 billion in the same period in 2010. We'll see how the vote proceeds on Tuesday and there may be a lot more at stake here for Brian Moynihan than whether or not he deserves to be chairman and CEO, which is why the the bank's board has started lobbying investors, ranging from top-20 investors to small-time, individual shareholders. I don't question Moynihan's character, integrity, or intelligence but I do wonder whether he's the right person to lead this bank during the next phase of (hopefully) expansion. By the way, you'll notice U.S. financials (XLF) sold off on Friday following the Fed's big decision. There's a reason for this. Big banks make money off spread and need economic growth and an upward sloping yield curve so they can borrow cheap and lend out at higher rates. The Fed's deflation problem also concerns big banks as well as big hedge funds. These are challenging times for all financial institutions and while the U.S. economy is in better shape than the rest of the world, it's hardly running on all cylinders and is vulnerable to global economic weakness. This is why the Fed did the right thing and didn't hike rates this week. Below, Ken Langone, co-founder of Home Depot and Invemed Associates president, weighs in on the fight to split the jobs of chairman and CEO at Bank of America and why he backs Brian Moynihan to fill those two roles. I don't agree with Langone's position on the dual role but I really like what he has to say about the competency of board members. CalPERS take note! On that note, I wish you all a great weekend and please remember to contribute via PayPal at the top right-hand side. I thank all the institutions that have subscribed to my blog and support my efforts in bringing you the very best insights on pensions and investments. Update: As expected, shareholders voted to allow Brian Moynihan to retain the tile of chairman. However, 37% voted against this dual role and among them were huge institutional investors. I added a clip where CLSA bank analyst Mike Mayo, reacts to the shareholder decision to keep together the role of CEO and chairman role at Bank of America. Listen to his sobering comments.